Before today, if you wanted an iced latte, you’d have to pull espresso, steam the milk, and cool it all down over ice. Those days are over. 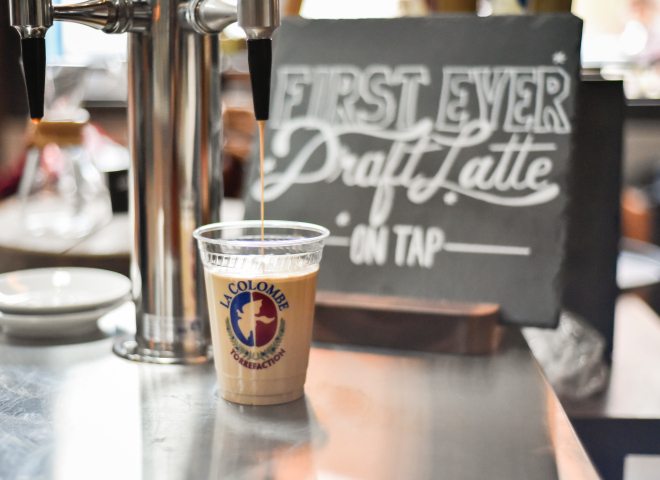 Introducing Draft Latte, the first-ever iced latte on tap. Cold-pressed coffee and frothed milk come straight out of the keg into your glass, already cool, creamy, and ready to drink. Our CEO, Todd Carmichael, has spent months tinkering with the recipe and the technology up in his Coffee Lab at our Fishtown café. He’s finally ready to share it, and let me tell you, it’s pretty mind-blowing. This full-bodied latte is naturally sweet, with no added sugar. Possibly even more impressive than the great taste is the texture. For months, Todd has been talking about “mouth-feel” and we didn’t really get it until we tried the stuff. With every sip, the silky microfoam fills your palate, cold and creamy, like a sugar-free milkshake.